Well, it’s that time of the year, cold temps, snow, ice, where you get to go sledding or stay inside with a fire ... well, not this year. This year we’ve broken a few records for high temperatures in November and December, and have yet to see any snow or ice. I guess it’s something of a pleasant surprise … I can’t say I enjoyed shoveling 8 inches of snow last year on Thanksgiving … but I’d be lying if I didn’t admit I do miss it a little. But, this is the way seasons work; you have pleasant winters, harsh winters, rainy summers, wet summers, etc., etc. Sooner or later, the snow, ice and 20s will arrive; and we’ll enjoy them when they do, but until then we will do our best to take advantage of the pleasant conditions. The last few weekends have been particularly productive days. We have cleaned a good portion of the backyard, which is about ready for construction of the chicken coop. We’ve also created a nice trail system through the unclear part, for hiking and the wilderness feel. So, even though we have removed a lot of the brush and trees in our backyard, there is still plenty of the thick mountain forest to roam. I also constructed a new firepit. I went back and forth for months on where to put it; but ultimately, decided to put it off the side of the house. It’s conveniently located off our back porch, and not too far from a floodlight, should we need some extra light. It is definitely nothing complex. I dug a shallow hole and then walked around our property gathering various rocks to outline it. I gathered a ton of rocks in order to have a variety to pick from, knowing some were going to fit together better than others. In the end, I like to think it was all about having the right rock, sitting the right way, to make the circle come together … but, really, it’s just a hole with some rocks around it. After I got it all put together and built a little fire, I realized the location I picked kind of sloped downward on one side of the firepit. And if you put a chair there and sat down, it literally felt like you were going to fall backwards, and roll down the mountain. So, I started thinking, and decided having a bench there, that was secured into the ground, wouldn’t have that feeling. I already knew I had the bench seat; I could use an old fence post that was wide and flat enough. It was originally part of our front fence, but the end rotted out, so I took it down and sawed off the rotted part. Fortunately though, it was still plenty long enough to serve as a bench for two people. The posts weren’t quite that simple. I’ve cut down quite a few trees, and was originally cutting them up to be used as firewood. But, some of them were so long and so straight, I was thinking I might be able to use those as fence posts at some point. So, I just left those as is, and stacked them all together (also saved me a lot of work). So, I just grabbed one of those trees, cut two pieces of identical lengths, buried half of each into the ground with the other half sticking up, and screwed the old fence post into the top of each. There was a little bit of sanding involved, and the post-hole digging was probably the hardest part, but all in all a pretty easy project. We ended up being very happy with the bench, and I think it kind of makes the firepit area. I think we're going to add two more, maybe a little longer, to the other sides of the firepit. Perhaps pointing them in an angle. 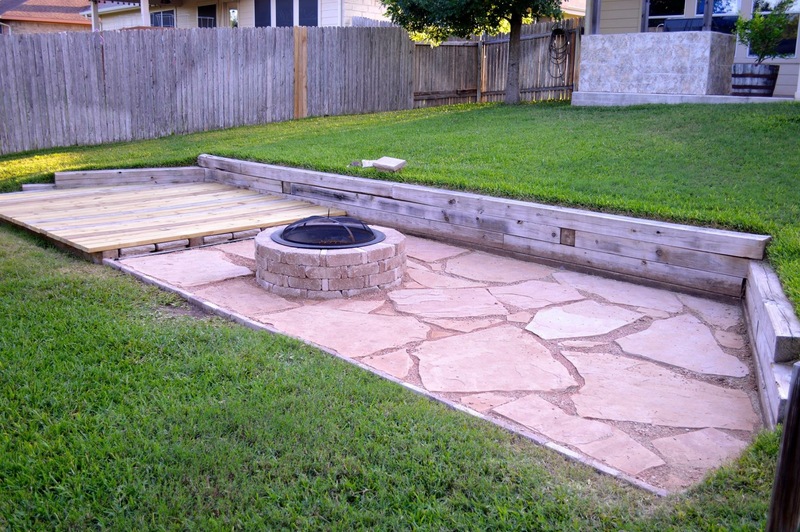 In no way, shape or form does it compare to the firepit I built at our home in Texas. That one was huge, very cool looking and just spectacular … it was also expensive. The patio rock and the stone to build the pit were all purchased from landscape stores. This time I took a different approach … we kept it simple, and we didn’t spend a dime on any of the supplies required. Everything we either got for free from someone who thought it was trash or found walking around on our property. Now that makes me happy! We’re a long ways from being the homesteaders I want us to be, no question, but to me being able to make something out of nothing is what homesteading is all about. And that’s what we did here. We wanted an outdoor fireplace, and needed a bench go around it. Instead of running to a store, we checked our shed for items that could be reused and then walked around our property to see what the land could provide. With those items and a little work, we were able to construct exactly what we wanted. Well, I hope everything enjoys a Merry Christmas and a Happy New Year. See you next year with (hopefully) many more completed projects to tell.